A Conspiracy of Breath by Latayne C Scott is an engrossing historical novel that explores what it felt like to be a Christian in the time of the Roman persecution. Told in a mesmerizing first person narrative voice, the story explores the life of one of the characters in the scriptures, Priscilla, and her life after the painful and shameful death of her father. The novel is so well written that it is hard for readers to draw the line between fiction and history, with the appropriate allusions to Greek and Roman mythology and history as well as elements of ancient cultures. Set against a cultural and religious backdrop when Christians suffered great persecution and when women were less considered, could an outspoken and daring woman of faith survive? There is much to savor in this narrative and the sheer elegance of the language, the powerful imagery, the strong historical and religious settings put a lot of life into the narrative. The dramatic, poetic imagery of the tree, beautifully personified, is just one of the wonderful examples of Latayne C Scott’s gift for compelling writing: “Tonight it looks like a woman bereft, so anguished she holds her hands straight above her head then puts her elbows together and lets her wrists fall behind her bowed head.” She is a great storyteller who knows how to create the intersection between biblical narrative and history, bringing to life a world that feels real to readers, and that allows them a delightful escape back in time. 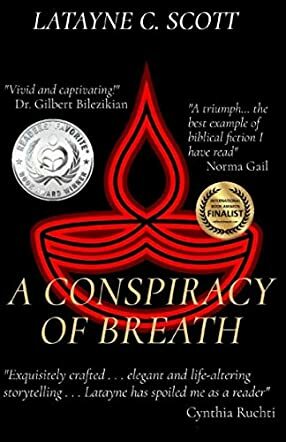 A Conspiracy of Breath is a gift of faith, as entertaining as it is inspiring.